This is my second card using a Distress Oxide background made a little while ago for the challenge over at CVC. I made my first quite a feminine card that can be seen here and this one is definitely for a man and in my vintage collage style that I love to use. I just love the rusty patina colours. If you have a moment please pop over to the CVC project blog to see more photos and to see how it came together. Wow Brenda what an amazing men's card I really enjoy men cards on other blogs because I think they are the most difficult onces, Your creation is really fantastic, beautiful background , great details , a real masterpiece!!! Brilliant collage my friend, LOVE that Oxide background too! You are already a master of these Oxides! Just Beautiful! This looks fabulous off for a closer look. Another stunner! Off for a closer look, and do you know? I had no idea there was another blog at CVC! How did i ever miss that?? Duh! It looks fabulous, will pop over to see more. Awesome card, Brenda! Love the background! Love how this all comes together so beautifully, Loving the look. The oxides and you of course, made the best background...love the splotches, and love the Father's Day theme. Fab card! It is super lovely, Brenda, gorgeous combo/patina effect! Fabulous Oxide background enhanced by a great collection of collaged elements . You make collaging look so effortless Brenda - like all the pieces were dropped and they just fell in the right places. Great idea too to create your own cabinet card frame . 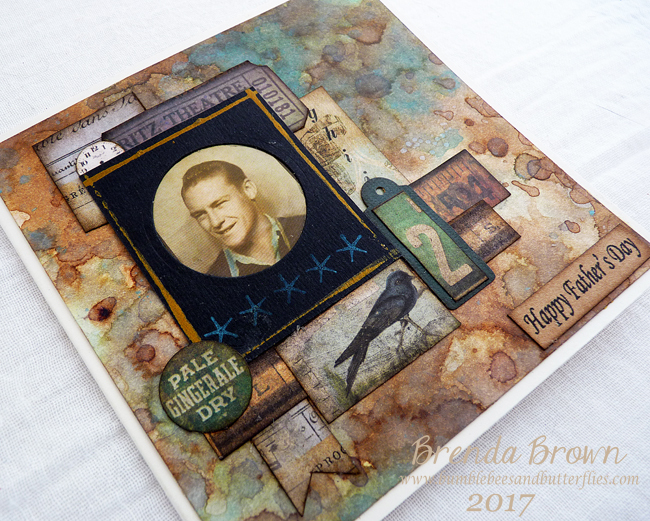 Gorgeously vintage Brenda love the oxides! !